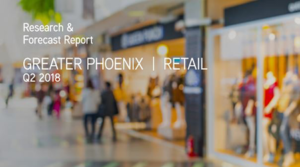 Phoenix, Arizona – Net absorption of retail space in Greater Phoenix surpassed 500,000 square feet for the second quarter in a row, which signaled continued improvement for the market. Limited construction of new space and tightening vacancy forced rental rates up during the last three months. The total net absorption for the first half of 2018 is up nearly 10 percent over the absorption posted during the first six months of 2017. The retail vacancy rate dipped to 7.6 percent in the second quarter, which is 130 basis points below mid-year 2017. The rate has been trending lower for the past 18 months and is now at its lowest point since mid-2008. Some of the strongest vacancy improvements have been experienced in the East Valley and Scottsdale submarkets. Rental rates rose to $14.99 per square foot in the second quarter, which marks a three percent rise in the past 12 months. Asking rents in the East Valley rose to above $15 per square foot for the first time since 2010. These rates are up 4.6 percent from one year ago. Investment activity softened a bit during the past three months with fewer properties trading hands and the median price dipping by almost 25 percent from the first quarter. Second quarter brought sales of more expensive properties in the $5 million and higher range. As the market sells these larger properties, cap rates are generally lower. The median price year to date is $160 per square foot, up from 2017, while the average cap rate is approximately 7.3 percent. The strong first half of 2018 signals what Colliers believes will be a robust remainder of the year. Traditionally, Phoenix posts its strongest retail performance during the second half of the year. As the economy strengthens and the health of the local housing market continues, consumer spending is expected to rise and support local retail real estate. 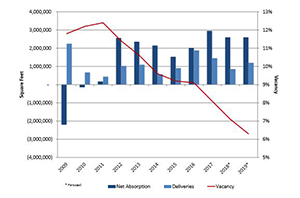 Investor demand and transaction volume of shopping center sales are expected to be steady since cap rates have remained relatively flat in the environment of rising interest rates.